Hey everyone, come out and see us tomorrow for 2nd Friday Night Out – Mesa in Downtown Mesa. Hello everyone, we will be attending FanX Salt Lake Comic Convention September 6-8, 2018 at the Salt Palace Convention Center. We’ll be in Artist Alley and our table numbers for this year are Purple 35 & 36! A BIG Thanks goes out to our good friend Greg for creating our flyer again this year! Hi everyone, come out and see us this Friday for 2nd Friday Night Out – Mesa – Summer Block Party! The event is from 6-10pm. We will be setting up out front of Gotham City Comics and Collectibles! 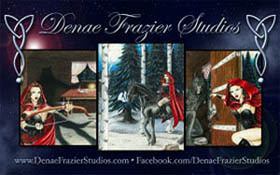 We’ll be selling Denae’s 6.75”x10.5″ & 11”x17” Art Prints, 1.5” Buttons, Magnets and her Pendants! Hi everyone, come out and see us tomorrow for 2nd Friday Night Out – Mesa – Cosplay! We’ll be selling Denae’s Art Prints, 1.5” Buttons and Magnets! Hey everyone, we are excited to announce that we’ll be attending WonderCon Anaheim March 23-25 at the Anaheim Convention Center again this year! At the event, we’ll be selling Denae’s Art Prints, Art Buttons, Pendants, Dog Tags, Magnets and we’ll have some of her Original Art For Sale too! We will be in Artist Alley at B-30! Hi everyone, come out and see us Friday (Feb. 9th) for 2nd Friday Night Out – Mesa – Swingin’ Sweethearts! We’ll be selling Denae’s 6.75”x10.5″ & 11”x17” Art Prints, 1.5” Art Buttons, Magnets and her Pendants! Hey everyone, it’s been a crazy couple of weeks getting everything ready for the 47th Annual Barrett-Jackson Scottsdale Auction January 13-21, 2018 at WestWorld of Scottsdale! And we finally got everything set-up for the event starting tomorrow! At the event we will be selling #Denae‘s #LimitedEditionArtPrints (Matted and Un-Matted options), #MetalArtPrints, #ArtButtons, #Magnets, and her #OriginalArt (Framed and Unframed). So, if you are planning to go check out all the cool cars, make sure to stop by our booth (NP24) to check out all of Denae’s cool art and say “Hi”!